Q: What is "Wonders of the Bible"? A: Wonders of the Bible is one of the largest private collection of Christian scientific and technological visual arts in the world today. 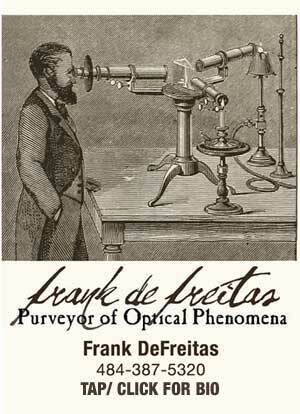 We began our collection in 1976, documenting the history of the Nobel prize-winning fields of lasers and holography. WOTB is now an entire collection in its own right, and our official traveling event. Q: What is your mission statement? A: We do not charge a set fee. Like many outreach ministries, we request a love offering (Rembrandt etchings, ancient Biblical scripture, and moon rocks do not come cheap). Groups are encouraged to give only as the Lord places on their heart. Q: What is unique or different about your exhibit? A: We want to be known as providing a "once in a lifetime" Christian experience that you will never forget. We specialize in exhibit items that, most likely, people have never seen before ... and might not ever see again. The term for this is "Sui Generis": which means "unique, in a class by itself". And that is what we strive for. 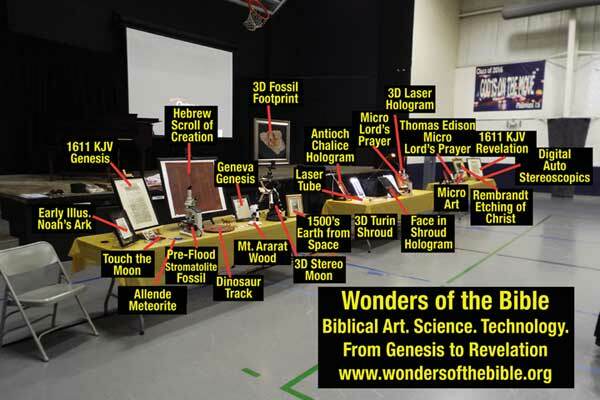 We bring world-famous Biblical archaeological artifacts to you as 3-dimensional laser holograms. We have the largest collection of the smallest micro- and nano-scale Biblical scripture in the world: so small it is invisible to the human eye. You will view these through microscopes. We have one of the largest collections of 19th century Christian based stereographs, so we like to bring a stereoscope with us to display. We exhibit one of only two "Face in the Shroud" computer-generated 3D laser holograms currently in the USA, along with a certified original Shroud of Turin albumen photograph first taken by Secondo Pia in 1898. We display original etchings of the Life of Christ by the world-famous artist Rembrandt. We display 1611 first edition King James Bible title pages of Genesis and Revelation; an ancient Hebrew scroll of Creation and the Flood; the first depiction of Noah's Ark in a Bible; along with wood samples brought back from a famous and well-known expedition to Mt. Ararat in search of Noah's Ark (yes, you can visually see the actual black pitch under a 3D microscope). And how about a depiction of the earth as it would be seen from space -- from a Bible in the year 1560! For Genesis and creation we have dinosaur tracks, fossil raindrops, stromatolites, the oldest known meteorite, cuneiform flood tablet, and you can "Touch the Moon" via a meteorite moon rock (NWA 5000)! So, yes, we believe this is a unique Christian and Creation experience for those that get a chance to experience it. Sui Generis! Q: What are the logistics of your exhibit? A: In order to make things as simple as possible, our entire exhibit was designed to be displayed on your own standard folding tables. We can exhibit a very simple single table set-up, showing a few examples of select items ... or a complete multiple table set-up, with each individual table being its own topical display. We can accommodate very small intimate gatherings, or larger events in the hundreds and even thousands (our largest event was 90,000 people for a weekend in NYC in 2017). Q: What is your educational presentation? A: We have a powerpoint presentation that provides interesting stories and educational information on all of the items on display in the exhibit: Bible pages, micro- and nano-scripture, Shroud of Turin research, meteorites, fossils, Biblical artifacts, and so on. Of course, our authority is with lasers and holograms, so we spend a little more time on the science and technology behind these Nobel prize-winning fields: such as "How are Holograms Made in the Laser Laboratory". If you're going to learn about laser holograms, you might as well learn from the person that "wrote the book" ... a book endorsed right on the cover by the MIT Museum. Q: What area of the country do you serve? A: At present, we serve a local area consisting of Eastern PA (Philadelphia, Lancaster, Harrisburg, Allentown, Reading, Scranton, etc. ), all of New Jersey, Eastern New York (NYC area, the Islands, etc. ), and all of Delaware, Maryland and Washington, D.C.
Q: Where have you exhibited and/or lectured/instructed? A: For 35 years I (Frank) presented laser and holography exhibits / lectures / workshop programs in world-class venues such as the Smithsonian Institution, Washington D.C. (summer workshop programs), the Franklin Institute in Philadelphia; Liberty Science Center, NJ; Lehigh University; University of Pennsylvania Museum of Archaeology and Anthropology; NASA / Northrop Grumman; Fuji Film Corp.; Dupont Holographics; and many, many more. By invitation, I have been a MENSA keynote address speaker at their regional conferences in 1999 and again in 2017. For Wonders of the Bible in particular, some of our more recent events have included: The Institute for Scientific and Biblical Research, Lancaster, Pennsylvania; The New York Hall of Science, New York City, New York; The Creation Evidence Museum, Glen Rose, Texas; Creation Celebration Conference 2017, Newark, Delaware; Scientific and Biblical Creationist Fellowship, Newark, Delaware; New York Microscopical Society, Clinton, New Jersey; Eastern Christian Conference, Hershey, Pennsylvania; ... and more. Q: How long are your exhibits and presentations? A: We can do single day, multiple day, and/or evening exhibits and presentations. Our powerpoint presentation runs about an hour. Before and after the powerpoint presentation, folks can visit our exhibit tables to see and experience the displays. Q: What part of the year are you available? How often? A: Our preferred seasons are spring and fall: three months in the spring (mar/apr/may) and three months in the fall (sept/oct/nov). This is to protect very valuable artifacts from the coldest and hottest travel weather. For each of those months mentioned above, we like to keep bookings to one or two events per month. So, as you can see, its good to grab us early. Q: Do you serve all Christian denominations? A: We serve everyone, believer and non-believer, and all are invited to participate in our events. For those who do not believe, you can enjoy the scientific and technological aspect (lasers, holograms, micro and nano tech, etc.). For believers, our exhibit and presentation is for all Christian denominations. We do, however, stand firmly on Biblical creationism, inerrancy, perspicuity and authority. θεόπνευστος (theopneustos): "God-breathed." In other words, the reason we have an exhibit dedicated to Genesis is because we believe that the Biblical account of Genesis is scientifically and historically true. However, YOU do not have to believe that the Biblical account of Genesis is true in order to enjoy the science and technology behind the exhibit. Along those same lines, you do not have to believe that the Shroud of Turin is the actual burial cloth of Jesus Christ. But you may enjoy the immense scientific and technological investigation that has been performed on it (such as 3D laser holographic imaging). And so on. The choice is yours ... as it always has and always will be. At the same time, for us, the Christian Holy Bible remains the ultimate authoritative foundation ... as it always has and always will be. A: Yes! One in particular comes to mind: We were exhibiting at the New York Hall of Science for World Maker Faire. At our table, someone read and experienced the Lord's Prayer for the very first time in their lives. It was being transmitted on a laser beam! They never knew that the Lord's Prayer even existed before that moment. They said that it was "beautiful" and "amazing". It was at that moment that I knew we had found an entirely new way of reaching others with the gospel of Jesus Christ. Q: Can we come and visit you? A: We would love that, but unfortunately, not at this time. 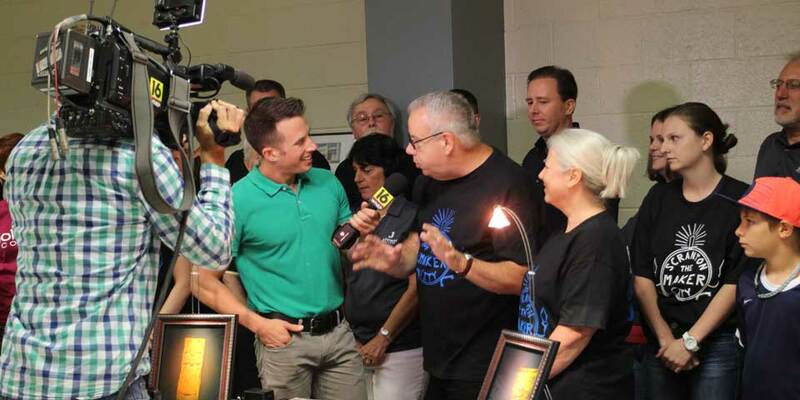 When we had our home holography studio / lab, we welcomed visitors from around the world for 35 years. Now that we have sold our home and moved into our retirement residence we no longer host visitors. Plus, everything is now packed in travel road cases and held in remote storage, ready to hit the road. We're ready when you're ready! Q: What about online presentations, i.e. videoconferencing with schools, etc.? A: Well, providers are installing giganet speed internet service in our area ... and I do have a small area here dedicated to a portable laser holography set-up ... so lets see what the future holds. As of 2019, I am now providing monthly presentations on various topics centered around the collection. There are monthly articles that contain downloadable resources, as well as audio files to listen to. You can access this new area by going to my Wonders of the Bible Online Presentations. Q: How can I get more information or book a presentation and exhibit? A: Call us (Frank and Debi) with any questions at: (484) 387-5320. or email at top of page (click on "contact").